Imperial Service Badge. 1. His Majesty the King has been graciously pleased to approve of (a) – A badge being worn on the right breast of officers and men of the Territorial Force when in uniform who take the liability to serve outside the United Kingdom in time of national emergency…  (b) Each Territorial Force Unit, 90 percent of whose serving members are under such liability, having that fact recorded in a suitable manner under its title in the Army List. 2. 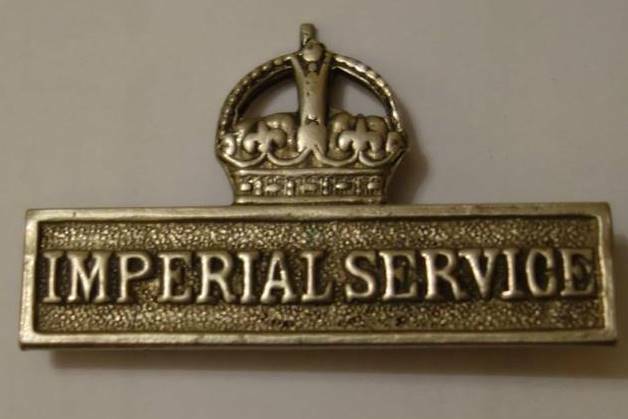 The badge will be a metal tablet, 1 5/8 inch [41 mm] by two-fifths inch [10 mm], bearing the words, ”Imperial Service” in raised letters, and surmounted by a crown three-fifth inch high. I (No.) 2566. (Rank) Pte. (Name) F. Bullen of the (Unit) 5th Norfolk Regiment do hereby agree, subject to the conditions stated overleaf, to accept liability, in the event of national emergency, to serve in any place outside the United Kingdom, in accordance with the provisions of Section XIII. (2) (a) of the Territorial and Reserve Forces Act, 1907. Last week-end about 360 of our Battalion had leave to go to their homes. It was quite like a Battalion parade… They came back with great stories of the scenes at Nottingham particularity. There, they tell us, a Territorial had only to step on to the platform to be embraced by dozens of Nottingham girls- that is, if the ”Terrier” was wearing an Imperial Service Badge. If not, it was a case of cold shoulder. So there’s the tip for the boys who want peace and quietness. No badge, no embraces. 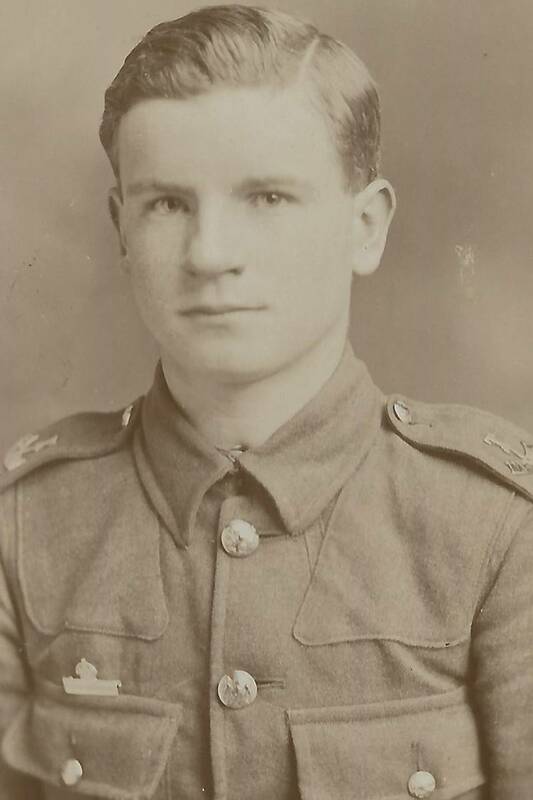 A young Territorial wearing an Imperial Service Badge while serving in the 7th Battalion, Devonshire Regiment. Note the T on his shoulder title, another indication that he is serving with the Territorial Force. The 7th Battalion was a cyclist battalion and remained in Britain for the duration of the First World War. As soon as a soldier signed the Imperial Service Obligation, he would be entitled to wear the Imperial Service Badge over his right breast while in uniform. 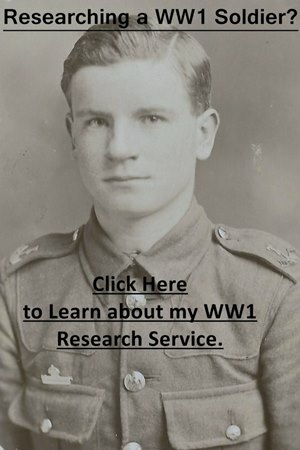 Occasionally, you see a soldier wearing the Imperial Service Badge on the left, either he was wearing the badge incorrectly or the photograph has been reversed. Imperial Service Badges were struck in a variety of alloys, typically cupronickel or brass, but can also be found in silver. Due to a large number of manufacturers, there can be a great variation in size. A photograph of a soldier wearing an Imperial Service Badge demonstrates that he served in the Territorial Force. Also, an Imperial Service Badge will most likely date the photograph between 1910 and 1915. If no service papers have survived and you are faced with multiple possibilities for a soldier, Territorial service can help you. This is due to Territorial soldiers typically having regimental numbers below 10,000 (NB. they were renumbered in 1917). Also, prior to the outbreak of war, those wishing to join the Territorial Force would only be able to join units close to where they lived. Find your soldier on the 1911 Census and have a look to see what the local Territorial Force units were.